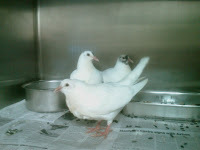 On Sunday 8/31, I went to SF ACC to pick up two roosters and a chukar to transport them to another Mickaboo volunteer in San Jose who was driving them on to their new home in San Juan Batista. It turns out there was a second chukar and so I took him, too. 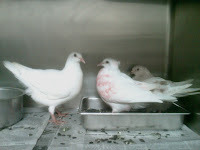 There were also eleven new king pigeons who, just the day before, had been purchased by a well-intentioned person from a live food market at Grant and Pacific. She wanted to set them free and save their lives but, since they're king pigeons, they don't know "free" and they just stood there, vulnerable and helpless. To her credit, she contacted Animal Care & Control and then brought them in. I wasn't there for pigeons and I don't have any room for new pigeons nor any new fosters who have room for new pigeons so I was very sad to hear about these eleven. When I looked in on them, I saw one that was obviously ill and so I pulled that one and brought her (?) home to foster and care for. I named her Nicky. Nicky had labored, gape-beaked breathing as if she'd just flown in from Idaho but she was just standing in the cage. She had to ride along with me to San Jose and back which didn't help her feel any better. When I got her home and examined her I saw that she had, in addition to her respiratory distress and missing feathers (from being picked on by other, healthier birds), she had some canker plaques in her beak and throat. 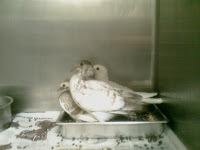 Canker can kill pigeons, especially young ones like her, but it is also treatable. She's convalescing in my kitchen and holding her own. The canker plaques have disappeared but her breathing is still distressed. She's on antibiotics and I'm hand-feeding her. When I took her to the vet yesterday, she looked really good (breathing almost normally) and so we focused on True (who looked really bad). Today her breathing is labored again. I'm hopeful that I can pull her through. True died last night and so she lost the company and tonic of a squeaker friend. 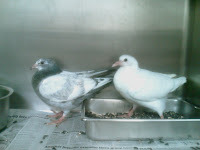 Young pigeons really benefit from having a nest mate, even if it's from a different family (or different size, type, color- See the Dill and Tess story). Nicky's lost ground and had a really tough night last night- gasping for air and exhausted by the effort. I contacted three different Emergency Animal Hospitals about housing her in an oxygen tank overnight. Two said they didn't treat birds (but quoted me $250 & $600 as likely cost) and the third didn't have any more tanks available. I decided to keep her home with me and we spent time out on the back porch (where the cool night air seemed to help) and then I opened up the windows, put on the fan and took her to sleep next to me so that I would know if she became distressed. It was a long night. Today I took her in to For the Birds and she's really struggling. She received Furosemide (the diuretic Lasik) which helped temporarily and is spending the night there in an oxygen chamber. Underlying causes (aside from the canker) are, for now, unknown. I'm afraid that she may not survive the night. Poor Nicky died last night. Donations to pay for her vet care are being accepted at MickaCoo. I don't know what I'm going to do but I can't keep doing this. If you save just one then it was worth it. Just remember if God needs an angel you must say "Goodbye" for now. When I loose a puppy I say to myself, "s/he just wasn't ready yet, next time". Then I say "I cant keep doing this". Then I see a puppy go to a loving happy home. Animals are a heart tugging labor of love. We do it cause we love them, but sometimes we have to say goodbye. We are like the gate keepers. Either we bring them to or send them through. Without people like us they have no chance. You can say to yourself that you kept them from passing in the streets. That's huge!